I captured the second year of Wet Ape's Keloha Art and Music Festival, last weekend here in Kelowna, and what a great weekend, building upon all the good vibes they created the first year. So far my facebook page has a couple photos up, with a bunch more on the way. 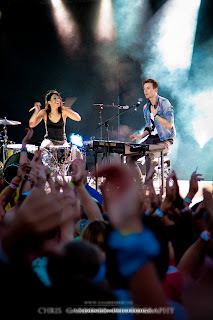 But you can take a look at my video of Matt and Kim's set on the island stage, after you hit the link! One of the most energetic performances of the weekend!